Police have arrested 14 suspects in connection to the Jerusalem assassination attempt, are holding them on various drug and weapons charges. 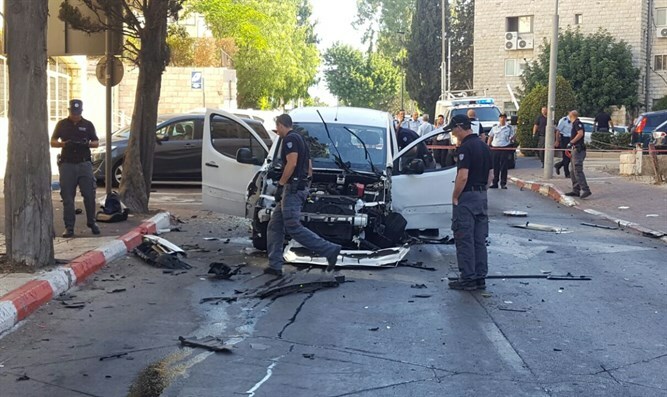 Jerusalem police have arrested 14 suspects in connection to a car bomb on July 27, which went off on Keren Hayesod Street, in a residential neighborhood of Jerusalem. The 14 suspects are variously accused of organized crime involving illegal weapons, drug trafficking, and auto theft. However, several of the gang are suspected of being the masterminds of the Keren Hayesod assassination attempt on Simo Malka's life. During the operation, a bomb was planted on the underside of the car. When Malka turned onto Keren Hayesod, the bomb detonated, though Malka survived. Police used cutting edge technology to unravel the case. Their first break-through came when they managed to identify the car of the assassins, and track its route from the center of Israel to Jerusalem, and back. Police eventually found the suspects' car, a stolen vehicle with false license plates. The car was found abandoned in Haifa, full of break-in equipment: gloves, ski masks, hacking tools, and mobile devices. Police believe that two of the suspects, Arabs from Jaljuliya, traveled on that fateful morning to Malka's Jerusalem address, and waited for him to leave his home. When Malka began to drive, and they realized his children were with him, they followed the vehicle until the children got out, and Malka was alone in the car, they left him and began to drive toward the city exit. When he arrived at Maapoh Street, the two detonated the bomb using a remote activation system, which destroyed the car and moderately injured Malka. At the beginning of August, two of the suspects were caught while fleeing from the police, while they were throwing away drugs in their possession, and driving a stolen car. Police investigators went on to raid a residential complex in Lod, confiscating weapons, hashish, and more than one kilogram (2.2 pounds) of cocaine. Several more suspects were arrested during the operation. As the investigation continued to progress, the not-yet-detained suspects heard of the police operations, and several attempted to flee into Judea and Samaria. One suspect was arrested at Rantis Checkpoint when he tried to flee. Another was identified in Judea-Samaria, and was taken down by a special unit in the area. Overall, police have arrested 14 suspects so far over the course of the investigation, all of whom have had their arrests extended. Prosecutors have submitted indictments against several of the group for drug possession and trafficking, weapons trafficking, and retaining stolen vehicles.